This coupler provides a simple and easy way to link together two cables with RJ11 plugs. The coupler is wired in a straight-through configuration. RJ11 female to RJ11 female. 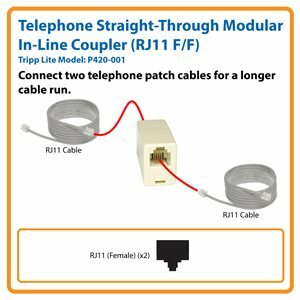 The Tripp Lite P420-001 connects two RJ11 telephone cords with male ends, allowing you to extend the cable run without buying a longer cable. This in-line coupler is wired in a straight-through configuration. Gold-plated connectors provide optimal conductivity with no signal loss. The P420-001 is compliant with the Federal Trade Agreements Act (TAA) for GSA Schedule purchases. The P420-001 comes with a lifetime warranty. It’s manufactured in compliance with strict RoHS specifications, reflecting Tripp Lite’s commitment to environmental responsibility.